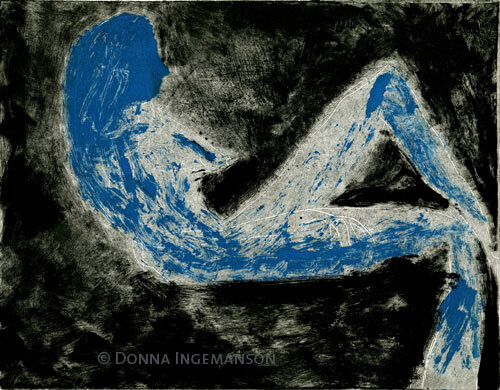 Ghost of Blue Figure monotype with line work. This past week, while working in the print studio, I got to a point where I was focused on a piece that just wasn’t resonating for me. My (mentor/teacher), Esther Maschio, gently told me that the only way to get to a better place was to keep working. After rifling through one of my sketchbooks I found a figure drawing that I had done a few months ago that always appealed to me-so I started rolling ink on a plate while using my leftover palette of blues, whites, graphite grey and black. It was like jumping off a diving board after standing still for too long. There was nothing to lose and my experimentation ranged from painting, to scratching, to applying a trace type of drawing. It was a very ‘in the moment’ experience. Above are the results from two stages of the process-moody & blue. Artists Trish Berube, Esther Maschio and Marie Tegler. Inspiration brews during Monday lunches with my art buddies. Working in the printmaking studio, sharing ideas and encouraging each other on is the best way to start the week. No electronics-just good will, creativity and courage. 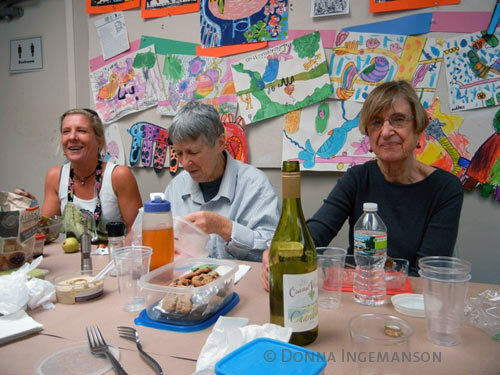 You are currently reading the process of creativity at donna ingemanson studio.